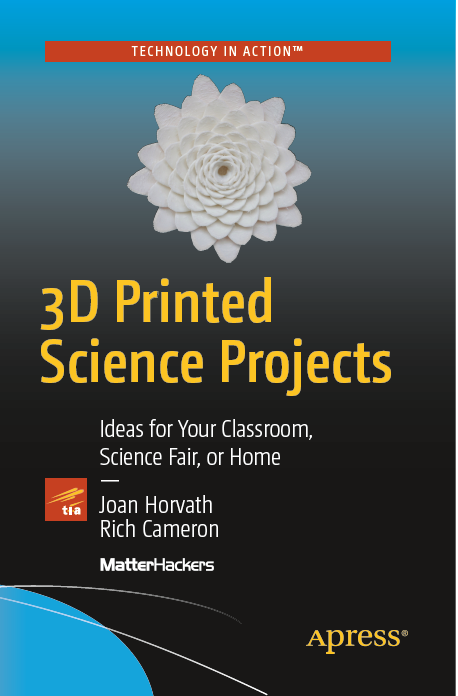 Our new book, 3D Printed Science Projects: Ideas for your classroom, science fair or home, (coauthored with Rich Cameron) is now available for preorder. This book shows parents and teachers how to use the models inside as starting points for 3D printable explorations. Students can start with these models and vary them for their own explorations. Unlike other sets of models that can just be scaled, these models have the science built-in. A busy teacher can just print a model for her class to pass around, or an ambitious student trying to do a great science far project can build on them. We have a "Learning Like a Maker" section in each chapter about what we, the authors, learned by making the models. We found that almost all textbooks have variations of the same 2D sketch for 3D (or more) concepts, and when you go to 3D you have to think differently and you learn a lot. The book cover image is from our plants and ecosystems models, where we allow you to "design" a plant or flower. We thank our friends at MatterHackers for letting us use MatterControl in the 3D printing screenshot examples. So far it is just available at Apress and through Apress' parent, Springer-Nature, but between now and the planned May release it will propagate to other places computer books are sold. To create the models, we pestered a lot of scientist friends as well as dusting off my textbooks and spending a lot of time in libraries. Thanks to everyone who made this happen, and is helping us with the last pieces as we scurry to meet our deadlines! We will be posting more about it as we get closer to the full release.